Android Central is buzzing with news of Wug's new root application. 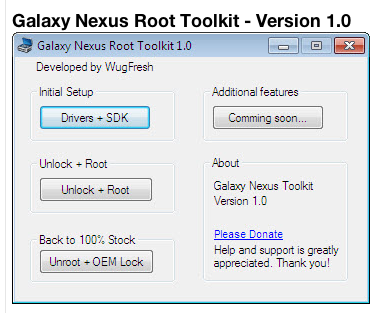 Specifically, Wug's Galaxy Nexus Root Toolkit contains all the files requires to both unlock (aka "root") your nexus and also to restore it to factory settings with the OEM lock. The kit contains the necessary drivers and SDK that will also install the latest samsung drivers, extract the latest android SDK to your %HOMEDRIVE% and more. For developers, you will also be able to update your systems "Path" environmental variable to include adb and fastboot locations however the entire Toolkit appears to only run on Windows. The Toolkit can push su.zip (Superuser.apk) to your Nexus's SD card and flash the clockwork mod. The device itself will walk you through the rest of the process via on screen instructions. Read the full feature set here. The reality is that it seems to be pointless for handset providers to lock devices. The average time until someone can root a particular device is nearing the point where root toolkits are sometimes available before the actual device is on the market. If you find this useful, please consider donating to the software publisher. Google's search engine ranking algorithms have always been a moving target. Two significant updates occurred in 2011 that have both raised and lowered rankings of many sites. Around February 2011, engineers tweaked the system, in what became known as the "Panda update". This could explain why more and more people are looking into free article writing services to get fresh content for their sites. The first update was focused on the North American markets however the changes were rolled out worldwide. So why did this update matter so much? It is very simple. Having your page show up on page one of the results is critical. Studies have been done that generally indicate around nine out of every ten clicks are on sites ranked one through ten, although I have never seen a perfect study. The penalty is simple. Panda penalized sites with poor quality content. Google has been fairly warning SEO firms that content is king and we agree. As written on our previous posts, original, relevant and timely content always beats black hat SEO tricks in the long run, nevertheless, so many people still try to land in the top ten spot with a site that has very little content of use to the searcher. This does not help anyone over the long term other than the SEO company that made a few bucks. "Almost the whole year of 2011 was a series of several updates related to content. Initially observed closely by SEO practitioners talking about the decrease of ranking of various sites and asking each other in forums if there was an observed algorithmic change and was dubbed as the Farmer Update which I believe the name probably came from Webmaster World where most group named algorithm updates come from. The changes were too evident already that when Google decided to talk about it already, they said they already have a name for the update and it was the Panda Update. And then this is were the series of updates came in." Google's Matt Cutts, an anti SEO webspam policeman, noted that in the initial rollout, only around two percent of Search Engine Ranking Pages (SERP's) were affected. Apparently many of those affected have simply been scraping content from other pages. This happens a lot with Technoracle posts. This site takes content from Technoracle, adds tons of ads and publishes. Such pages will never beat the original page in terms of rankings unless some additional content is interpreted as useful. Panda has been criticized, largely by those who feel their sites were unfairly ranked lower. Since the original Panda release, an update has shown promise to fight perceptions of false positive rates (FPR's). Barry Schwartz reported that some sites actually recovered after the 2.2. rollout. Google’s Panda update runs for all languages worldwide except for Chinese, Japanese and Korean. The big take away from all of this? Simple. Like in real estate (Location, Location, Location), in SEO land the mantra is Content, Content, Content. Focus on good, unique content and interested parties will come. This is a personal blog post. Since I, Duane Nickull, no longer working at Adobe, I have received a ton of emails from people asking for help on various Adobe related technical issues. I don't want to sound uncaring or unsympathetic, but the reality is that I cannot offer these services for free anymore. Adobe has made a conscious decision to cut down on the number of employees helping their community and customers. I was one of those and if I continue to offer free help, I working for free. Please understand that this is not a personal attack, retribution or in any way something I am doing to be vengeful. It is simple cause and effect. I want to thank the 98% majority of you who respect this and understand why I am no longer offer free, unpaid consulting, development, tutorials or help around Adobe products. For the few of you who have issues with it, please bring it up with Adobe. It is their responsibility to ensure adequate support for their technologies and perhaps it will do you and them some good if they can let them know where they can be more effective. Uberity.com is my new company and we are working on something cool and new. At the same time however, if you are really stuck and need consulting or IT services for LiveCycle ES, Flex Mobile Development or AIR development, Uberity does offer these services for a very reasonable rate. Simple email info (at) uberity (dot) com. Every Uberity employee is either a MAX Master, evangelist or top engineer from an Adobe product. We employ the best of the best and would love to help you for a fair price. We are open for business. Once again, I also want to point out that there is no anger intended here. This is just a simple boundary that needs to be set in order to help manage expectations. I am not ruling out that I may print some tutorials in the future either but these will be done on a less frequent basis. Best wishes to everyone for a prosperous 2012! !